Not so long ago in order to have a one off scrumptious meal, an ordinary citizen was required to go through the travails of an inordinately long distance to an upmarket restaurant and satiate one’s palate. On the downside, however, this would entail one to have deep pockets and would limit such visits to only a couple in a month. Recognizing the dearth of time in people’s lives and their urge to have everything readily delivered to them, the young Indian entrepreneurial minds tapped into a market segment that had high risks coupled with higher rewards. This sector was ‘Food Delivery’. This Article aims at analysing the business models of such food delivery startups and how Goods and Services Tax (‘GST’) will have an impact on their operations, margins and compliances. 2.1.1 The website operates through a mobile appthat depicts menus of different restaurants. Exampleof such websites are Swiggy, JustEat, TinyOwl etc. 2.1.2 The website has tie ups with different restaurants and offers its services of food delivery. The customer orders food on the website and makes the payment either through credit/debit card or in cash on delivery. The payments are collected by the website. 2.1.3 The website charges commission ranging from 7.5% to 20% from restaurants for getting them orders and also charges commission to list them on its website. 2.1.4 At the end of the month/week, the website, after deducting its commission, makes net payment to the restaurant for food sold via its website. 2.1.5 Currently,the website charges Service tax from restaurants on its commission. 2.2.1 The website operates through an app which shows its own food menu. The website operates solely on delivery model and has nodine-in facility. Example of such websites are Batman Delivers, Yumist, FreshMenu, Madbites etc. 2.2.2 The website charges for food (and sometimes for delivery). 2.2.3 Currently, the website charges Value Added Tax (‘VAT’) on sale of foodto its customers. There is no Service tax on food outlets purely into delivery without any dine-in facility. Between Restaurant & Website ♣ Service Tax levied on commission charged by the website. ♣ One area of concern is whether supply of food from restaurant to the website (for delivery to customer) shall also be considered as a supply, subject to GST. This view emerges from a combined reading of the term ‘agent’ that is inter alia defined to include a person who supplies or receives goods on behalf of another and the term ‘supply’ that includes transactions between a principal and an agent and the term ‘supplier’ that means any person supplying goods/services and includes an agent acting on behalf of such supplier in relation to the goods and services. ♣ This further gets strenghtened by reading the Schedule I of the Model GST Law, where supply of goods without consideration by a taxable person to another taxable/ non-taxable person in the course or furtherance of business are deemed to be a ‘supply’. ♣ Basis the above, a view emerges that transaction of handing over (supply) of food by the restaurant to the website (even though the website acts as an agent) may be subject to GST. ♣ Although, the above view seems visible upon reading the provisions of the Model GST law, any such interpretation shall make the concept of agent redundant and the concept of GST flawed. 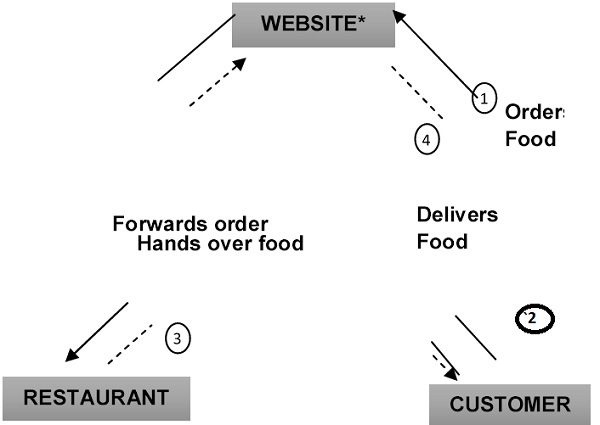 Between Website & Customer ♣ The website may charge a consideration for delivery of food to the customer on which Service tax may apply. ♣ As discussed above, transaction between the website and the customer may get covered as a supply, subject to GST. However, this issue is subject to clarification from the Government. Between Customer & Restaurant ♣ The restaurant charges VAT and Service tax (in some cases) on sale of food. ♣ In an ideal scenario, the restaurant should charge GST on sale of food, to be collected by the website for onward transfer to the restaurant. Similarly, commission earned by the website should be subject to GST. ♣ Other than the above, there should be no tax implications under this model. 3.1.1. Further, should the transaction of delivery of food from the restaurant to the website be considered a supply, there are different challenges to be managed. Currently, restaurant raises invoice to the customer. Under GST the restaurant may have to raise the invoice in the name of website so that the latter is able to avail credit of tax paid. Further, the website will raise invoice on the customer. This will also cause issues around valuation considering a principal-agent relationship between the restaurant and the website. 3.2 Now, moving towards the ‘Cook and Deliver’ business model, complications faced by websites under this model will be less in comparison to the Marketplace Model. As per Schedule II of the Model GST Law, the activity of Cook and Delivery shall be a ‘deemed supply of service’. Thus, supply of food to customers under this model should be subject to GST. 3.2.1 The Cook and Deliver Model shall face a significant benefit in the form of reduction in its costs. Under the current tax regime, service tax paid on input services that are utilised by the website is treated as a cost. This is because the website is engaged purely in sale of food (goods), thus, having only VAT liability and no Service Tax liability. Under the GST regime, input tax paid by the website shall be available as credit (‘ITC’), hence, reducing their cost burden. ‘(2) The place of supply of services, except the services specified in sub-sections (4), (5), (6), (7), (8), (9), (10), (11), (12), (13), (14) and (15), made to a registered person shall be the location of such person. (3) The place of supply of services, except the services specified in sub-sections (4), (5), (6), (7), (8), (9), (10), (11), (12), (13), (14) and (15), made to any person other than a registered person shall be (i) the location of the recipient where the address on record exists, and (ii) the location of the supplier of services in other cases. 3.2.3 In view of the aforementioned provisions, the Cook and Deliver Model may get covered under sub-section (5) if such food delivery websites get covered as a ‘restaurant’. Under the current tax regime and under the Model GST Law, there is no such inclusion. This takes us to the general provisions, viz, sub-sections (2) and (3). It can be construed that in either case, such supply shall be covered as inter-state supply, subject to IGST. Resultantly, this will have added compliance burden on the website such as compulsory registration, no option of being registered under Composition Levy etc. 3.3.1 The Model GST Law proposes to cover online websites including the food delivery startups as Electronic Commerce Operator (‘ECO’) defined under Section 43B of the Model GST Law. Such ECOs will get covered under the ambit of the new levy of collection of tax at source (‘TCS’) under section 43C. 3.3.2 Let us try and understand how the website shall collect and deposit TCS on behalf of the restaurant with the help of an example. 3.3.3 Customer buys food worth INR~1,000 and pays INR~200 (20% GST rate assumed) as GST on the same to the website. Thus, the website collects INR 1,200 on behalf of the restaurant and passes the consideration net of commission. **Consideration for food is INR1,000. TCS collected on the same would be INR200 (assuming TCS rate is same as GST rate). Website would pass on [consideration for food less TCS less commission charges (including tax)] to the restaurant, i.e., INR1,200 – INR200 – INR120 = INR880. The restaurant will avail INR20 as ITC and the website will deposit INR200 to Government to the credit of the restaurant. 3.3.4 The provision of TCS means that everytime the website makes payment to the restaurants, it shall have to collect tax at source and deposit with Revenue on a monthly basis and file requisite returns. This process will surely lead to loads of added compliances for a website in terms of deducting taxes, filing returns and keeping records for all such transactions. 3.3.5 This also means lesser cash flows for the restaurants and should any restaurant be less than the GST registration turnover threshlod, any such tax deducted by the website will need to be taken as a refund. 3.3.6 Whether the Cook and Delivery websites will have to collect TCS? 3.3.7 The obligation to collect and deposit TCS is only on an ECO. In accordance with the definition of ECO, it can be construed that a person engaged in a cook and delivery website should not qualify as an ECO since he is engaged in supply of service on his own behalf. It is apparent that GST will surely create a paradigm shift in the way businesses will be done. For the country as a whole, GST will bring out radical changes. Since the Indian GST strucutre is dual in nature, businesses would need to now comply with many more statutory requirements in the form of returns, tax payments and registrations. This shall also result in increased working capital requirements and perhaps, increased investments in management and finance. The food delivery websites should gear up with the changes that may be required in their supply chain and ERP systems to avoid any last minute unnecessary complications. Authored by Nimish Goel, Partner and Head of Indirect Tax/GST at International Business Advisors (www.ibadvisors.co). Nimish has a vast experience of more than 13 years in Customs, Excise, Service tax and VAT. Nimish has been a part of EY India and then with KPMG in Europe where he learnt the nuances of GST and is a regular author of articles on issues related to indirect taxes including GST. For any professional assistance, he can be reached on nimish.goel@ibadvisors.co. Uday Mehta, Article Trainee assisted him in this article.